Definitely up there in the all time top three of essential workshop machines, a mitre saw will more than pay for itself both in terms of time and effort saved, and increased reliability and accuracy. This compact example would be equally at home in a small workshop or in an 'away' kit for site work. Accuracy was spot on straight from the box. Like most pro kit, there is plenty of adjustment built in, so the user can keep the saw in tip-top shape. I found the GCM 8 S to be very user friendly, due in some part to the vertical handle and relative blade position. The action is firm and positive, never giving the impression of uncertainty. It is sufficiently powerful for the vast majority of woodworking requirements, and capable of dealing with all I asked of it, but I did find the universal motor a bit on the noisy side at times. The laser is adjustable to a point - it's best to view it as a rough guide in my opinion - while the work light, though fixed, will likely be the more popular of the two. On full extension of the pull-out slide it's advisable to lower the additional rubber foot under the front locking knob for extra stability. I found that the saw maintained its accuracy across the full bevel width. After using the quick-release types to be found elsewhere, the work-holding clamp's threaded adjustment felt very pedestrian. The depth stop is one of the best I've yet seen, and is as solid as all the controls on this compact saw which boasts first-rate build quality. 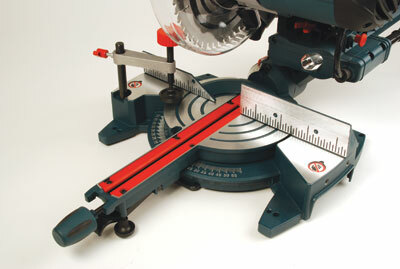 An excellent example of the compact mitre saw, solid and accurate. 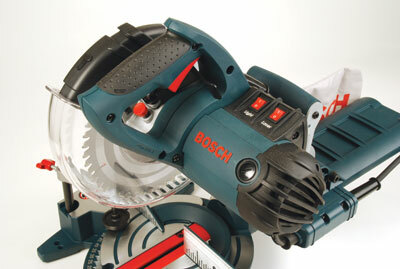 "An excellent example of the compact mitre saw, solid and accurate"